What Is Renewable Energy Technology? Powersystems explain all! With so many projects successfully constructed and exporting power to the grid, whether requiring a turnkey installation, electrical infrastructure or grid connection, Powersystems are an experienced partner in all forms of renewable energy generation project. Growing environmental awareness has heightened interest in all forms of renewable energy. This form of energy relies on the nuclear fusion power from the core of the Sun. This energy can be collected and converted in a few different ways. 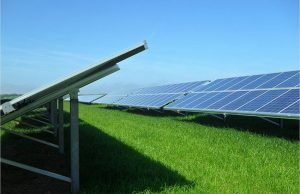 Research and development continue to improve existing solar energy technologies while identifying emerging innovations such as photosynthetic-based solar energy technologies and solar enhanced fuels. Innovations and developments in solar energy technology and enhanced fuels will benefit everyone by making affordable and reliable energy more accessible to more UK businesses and households. 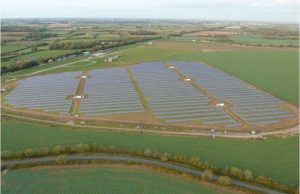 There has been a large uptake in the number of solar parks being granted planning consent in the UK. 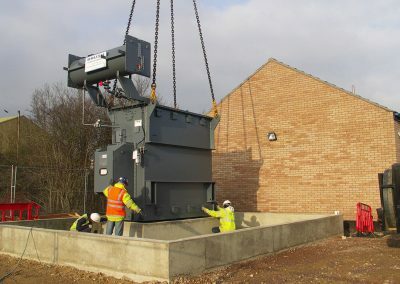 Powersystems has been involved with many of these providing grid connection schemes at 11kV & 33kV. 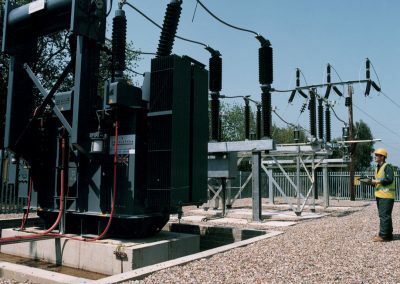 Each scheme is designed by our team of engineers and covers the requirements of the Distribution Network Operator (DNO) substation, site wide earthing and cabling to the point of connection. The whole process is managed, from initial connection application to final energisation and adoption. The movement of the atmosphere is driven by differences of temperature at the Earth’s surface due to varying temperatures of the Earth’s surface when lit by sunlight. Wind energy can be used to pump water or generate electricity, but requires extensive areal coverage to produce significant amounts of energy. Wind power is generated by converting the kinetic energy of the atmosphere into useable electricity with wind turbines. Wind is generated by complex mechanisms involving the rotation of the Earth, the heat of the sun, the cooling effect of the oceans and polar ice caps, temperature gradients between land and sea, and the physical effects of mountains and other obstacles. Wind turbines convert the force of the wind into a torque (rotational force), which is then used to propel an electric generator to create electricity. Wind energy power stations (known as wind farms) commonly draw on the output of multiple wind turbines through a central connection point to the electricity grid. Across the world there are both on-shore (on land) and offshore (out to sea) wind energy projects. How is wind energy used in UK? The United Kingdom is one of the best locations for wind power in the world and is considered to be the best in Europe. In 2017 Wind power contributed 15% of UK electricity generation and 18.5% in the final quarter of 2017. Onshore wind power has the lowest levelized cost per MWh of electricity generation technologies in the United Kingdom when a carbon cost is applied to generating technologies. In 2016, the UK generated more electricity from wind power than from coal. 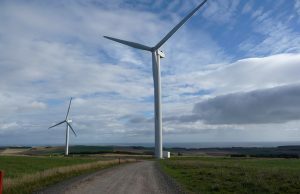 By mid-March 2019, it consisted of 9,685 wind turbines (Powersystems has completed 25% of these projects) with a total installed capacity of over 20.7 gigawatts and 12,848 megawatts of onshore capacity and 7,895 megawatts of offshore capacity. This placed the United Kingdom at this time as the world’s fourth largest producer of wind power. Polling of public opinion consistently shows strong support for wind power in the UK, with nearly three quarters of the population agreeing with its use, even for people living near onshore wind turbines. Through the Renewables Obligation, British electricity suppliers are now required by law to provide a proportion of their sales from renewable sources such as wind power or pay a penalty fee. The supplier then receives a Renewables Obligation Certificate (ROC) for each MW·h of electricity they have purchased. 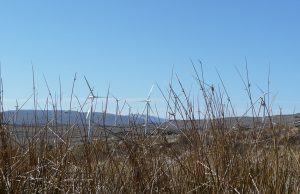 Within the United Kingdom wind power is the largest source of renewable electricity and the second largest source of renewable energy after biomass. In 2017 the Financial Times reported that new offshore wind costs had fallen by nearly a third over four years, to an average of £97/MWh, meeting the government’s £100/MWh target four years early. Experience in the design and installation of high voltage electrical infrastructure has placed Powersystems in a position ideally suited to carryout wind farm electrical balance of plant contracts. Since our first wind farm installation at Goonhilly Downs in 1992 we have been actively involved with wind farm projects ranging from single turbines to 60 plus turbine sites. Design, specification, installation and commissioning of wind farm switchgear, transformers, cable infrastructure, earth systems and SCADA cabling, enabling the complete installation to be carried out. 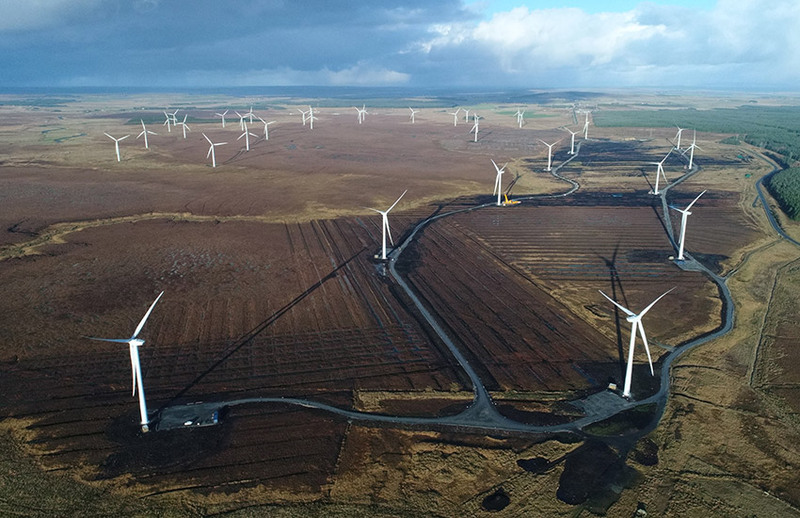 On each wind farm site Powersystems carry out grid connection compliance studies, ensuring that the requirements of the connection or grid code are met. 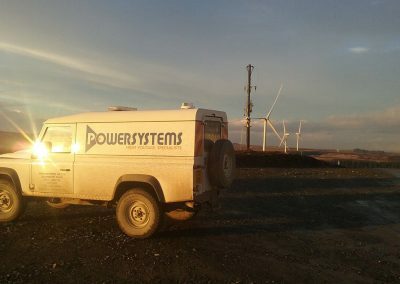 In addition to the on site electrical balance of plant works Powersystems can provide grid connections to wind farm sites, and have done so in some extremely remote and challenging locations. Hydropower uses the force or energy of moving water to generate power. This power is also called ‘hydroelectricity’. Hydroelectricity is electricity produced from hydropower. In 2015, hydropower generated 16.6% of the world’s total electricity and 70% of all renewable electricity and was expected to increase about 3.1% each year for the next 25 years. The cost of hydroelectricity is relatively low, making it a competitive source of renewable electricity. The hydro station consumes no water, unlike coal or gas plants. The average cost of electricity from a hydro station larger than 10 megawatts is 3 to 5 U.S. cents per kilowatt hour. With a dam and reservoir it is also a flexible source of electricity since the amount produced by the station can be varied up or down very rapidly (as little as a few seconds) to adapt to changing energy demands. Once a hydroelectric complex is constructed, the project produces no direct waste, and in many cases, has a considerably lower output level of greenhouse gases than fossil fuel powered energy plants. Run-of-river hydropower: a facility that channels flowing water from a river through a canal or penstock to spin a turbine. Typically a run-of-river project will have little or no storage facility. Run-of-river provides a continuous supply of electricity (base load), with some flexibility of operation for daily fluctuations in demand through water flow that is regulated by the facility. Storage hydropower: typically a large system that uses a dam to store water in a reservoir. Electricity is produced by releasing water from the reservoir through a turbine, which activates a generator. Storage hydropower provides base load as well as the ability to be shut down and started up at short notice according the demands of the system (peak load). It can offer enough storage capacity to operate independently of the hydrological inflow for many weeks or even months. Pumped-storage hydropower: provides peak-load supply, harnessing water which is cycled between a lower and upper reservoir by pumps which use surplus energy from the system at times of low demand. 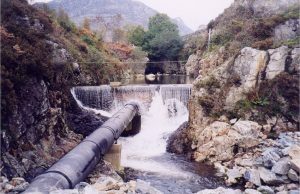 When electricity demand is high, water is released back to the lower reservoir through turbines to produce electricity. Hydropower is generated when falling water is channelled through water turbines. The pressure of the flowing water on turbine blades rotates a shaft and drives an electrical generator, converting the motion into electrical energy. Hydropower is the most advanced and mature renewable energy technology, and provides some level of electricity generation in more than 160 countries worldwide. Hydropower plants range from very small to very large individual plants and vast integrated schemes involving multiple large hydropower plants. This form uses the gravitational potential of elevated water that was lifted from the oceans by sunlight. It is not strictly speaking renewable since all reservoirs eventually fill up and require very expensive excavation to become useful again. At this time, most of the available locations for hydroelectric dams are already used in the developed world. Hydropower is the oldest form of renewable energy and Powersystems have been involved in constructing the electrical infrastructure on small scale hydro schemes since the late 80’s. Cofiring with biomass has increased in coal power plants, because it makes it possible to release less CO2 without the cost associated with building new infrastructure. Co-firing is not without issues however, often an upgrade of the biomass is beneficiary. Upgrading to higher grade fuels can be achieved by different methods, broadly classified as thermal, chemical, or biochemical. Biomass is the term for energy from plants. Energy in this form is very commonly used throughout the world. Unfortunately, the most popular is the burning of trees for cooking and warmth. This process releases copious amounts of carbon dioxide gases into the atmosphere and is a major contributor to unhealthy air in many areas. Some of the more modern forms of biomass energy are methane generation and production of alcohol for automobile fuel and fueling electric power plants. 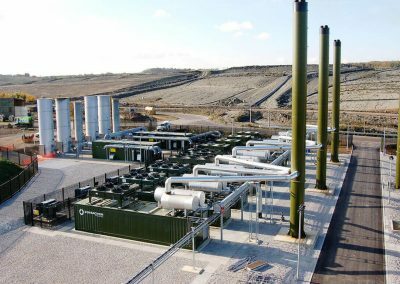 In an ever-increasing bid to fulfill the UK’s requirements for new renewable energy fuel sources, Powersystems have assisted customers in the design and construction of generation plants powered by Bio-Fuels. 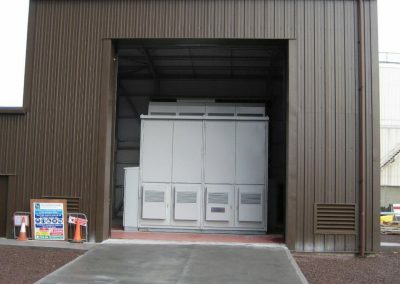 Typically, the generation of these schemes are via reciprocating prime movers, therefore the years of experience gained in Landfill and Anaerobic Digestion (AD) Generation sectors gives Powersystems a lead when advising customers on all aspects, from site layout to electrical infrastructure, ensuring both best design practice and cost-effective solutions. Is a collection of processes by which microorganisms break down biodegradable material in the absence of oxygen. The process is used for industrial or domestic purposes to manage waste or to produce fuels. Anaerobic digestion is used as part of the process to treat biodegradable waste and sewage sludge. As part of an integrated waste management system, anaerobic digestion reduces the emission of landfill gas into the atmosphere. Anaerobic digesters can also be fed with purpose-grown energy crops. Anaerobic digestion is widely used as a source of renewable. The process produces a biogas, consisting of methane, carbon dioxide, and traces of other ‘contaminant’ gases. This biogas can be used directly as fuel, in combined heat and power gas enginesor upgraded to natural gas-quality biomethane. The nutrient-rich digestate also produced can be used as fertilizer. Although currently an infant market with approx.650 AD plants at March 2019 we see this as a sector that will grow and plan to be at the head of any expansion, as Bio-Fuel technologies develop. 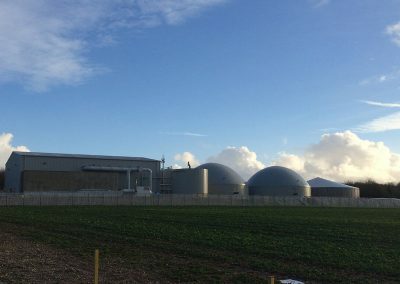 Powersystems have connected Anaerobic Digestion (AD) generation plants powered from commercial food waste, energy crops, dairy, pig & poultry waste in the farm-based sectors. We have worked alongside the major technology providers in delivering both grid connections and onsite customer works. Typically these schemes will be cable connected to the local distribution high voltage network and electrically metered onsite, from there a bespoke site distribution system is designed and installed to meet the AD Plants requirements. 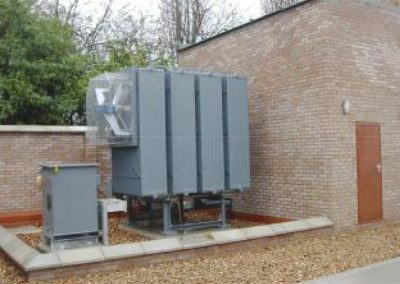 This system would usually be comprised of a generation transformer and main Low Voltage (LV) distribution board, providing electrical circuits to the site generation and AD Plant controls. Powersystems as part of the installation can specify and install the necessary Feed In Tariff (FIT) meters and auxiliary supply meters to enable generation and auxiliary loads to be appropriately allocated. 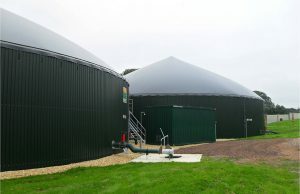 To date Powersytems have connected over 30 Anaerobic Digestion sites throughout the UK with many more coming online in the near future. Hybrid technologies can reduce the risk for investors and ensure immediate reliability and affordability. They can also support a smoother transition to more renewable energy generation in the future. An example of a hybrid technology would be a power plant which combines and manages electricity generation from at least two technologies. For example, a plant that integrates solar energy technology with energy from gas, or another renewable source, to provide a combined energy flow that drives the plant’s power generation. What are enabling (or related) technologies? Enabling and related technologies are those which use, or more easily allow, one renewable energy source to be used with another. These technologies are especially prevalent in the fields of energy storage, grid management and connection, information and communication, mapping and resource identification, forecasting and modelling. These are also not strictly renewable energy resources but are very abundant in availability and are very low in pollution when utilized. Hydrogen can be burned as a fuel, typically in a vehicle, with only water as the combustion product. This clean burning fuel can mean a significant reduction of pollution in cities. Or the hydrogen can be used in fuel cells, which are similar to batteries, to power an electric motor. In either case significant production of hydrogen requires abundant power. Due to the need for energy to produce the initial hydrogen gas, the result is the relocation of pollution from the cities to the power plants. There are several promising methods to produce hydrogen, such as solar power, that may alter this picture drastically. Geothermal energy holds the promise of being a renewable energy source that could operate 24 hours a day, providing baseload power for homes and industries. Geothermal energy can be used for heating and cooling purposes. There are a number of buildings, residential homes and swimming pools that currently use geothermal for these purposes. Energy left over from the original accretion of the planet and augmented by heat from radioactive decay seeps out slowly everywhere, everyday. In certain areas the geothermal gradient (increase in temperature with depth) is high enough to exploit to generate electricity. This possibility is limited to a few locations on Earth and many technical problems exist that limit its utility. Another form of geothermal energy is Earth energy, a result of the heat storage in the Earth’s surface. Soil everywhere tends to stay at a relatively constant temperature, the yearly average, and can be used with heat pumps to heat a building in winter and cool a building in summer. This form of energy can lessen the need for other power to maintain comfortable temperatures in buildings, but cannot be used to produce electricity. Waste-to-energy (WtE)or energy-from-waste (EfW) is the process of generating energy in the form of electricty and/or heat from the primary treatment of waste, or the processing of waste into a fuel source. WtE is a form of energy recovery. Most WtE processes generate electricity and/or heat directly through combustion, or produce a combustible fuel commodity, such as methane, methanol, ethanol or synthetic fuels. With an ever-changing waste management industry, government regulations have forced the market to look at new ways of managing the UK’s waste. A result of which has been the design and construction of cleaner more efficient Energy From Waste (EFW) plants. Such plants can generate electrical power via steam driven turbines or develop a ‘Syngas’ for turbine or reciprocating generation. 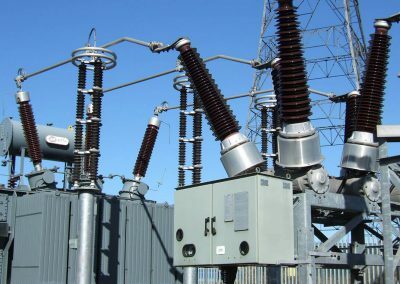 In either form Powersystems have assisted customers in cost effective grid connections and onsite electrical infrastructure. Ocean thermal energy: This is generated by converting the temperature difference between the ocean’s surface water and deeper water into useful energy. Ocean thermal energy conversion (OTEC) plants may be land-based as well as floating or grazing. The UK has one of the largest marine energy resources in the world, estimated to be more than 10GW. This along with the predictability of tidal power makes it a form of Renewable Energy that is highly attractive to grid operators as fossil fuel back-up plants are not required. To support this emerging technology, tidal projects will be eligible for five Renewable Obligation Certificates (ROCs) from the UK Government for projects installed and operational by 2017. 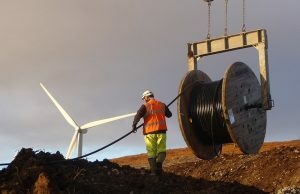 Powersystems are actively involved with the construction of the electricity infrastructure to connect marine turbines to the onshore grid. Recent project successes include the 400kW Delta Stream demonstration device in Ramsey Sound, Pembrokeshire, a demonstration device due to be in service for 12 months. Powersystems Asks Can A Country Achieve 100%? If you think 100% renewable energy will never happen, think again. Several countries have adopted ambitious plan to obtain their power from renewable energy. These countries are not only accelerating Renewable Energy installations but are also integrating Renewable Energy into their existing infrastructure to reach a 100% Renewable Energy mix. Read the article from Powersystems on Renewable Energy, Climate Change and Policy to find out where we are in the UK on renewable energy targets and plans to take us to 2050 with a cleaner brighter future. To speak with the Powersystems team, please feel free to contact us!